In honor of John Cusack's masterpiece High Fidelity, I've constructed a "Top 5 Best Beers" list. This list will be composed entirely from my pallet's judgement, and I happen to have a passion for Deutschland wheat beers, so that's just what comprises the majority of these 5 selections. I trust that throughout the long life ahead of me, this list will adapt as I become privileged enough to taste a wider beer variety. Hailing from America's oldest brewery in Pottsville, Pennsylvania, the Yuengling traditional lager is a true staple of my beer passion - and patriotism. Yuengling is my number one domestic, non-micro brewed choice. Described commercially as having a "deep amber color and a mild hop character". Found on tap for $6/0.5 Liter at Gainesville's very own Stubbie's, this dark wheat beer possesses a complex taste that embraces a subtle, hidden fruit sensation. Described commercially as "malty and mellow", the spices are flavorful and tame. This beer has a delightfully soft finish to boot. Brewed out of Freising, Oberbayern, Germany by Weihenstephaner. Duvel is a delectably constructed beer that blends the fine aromas and taste of well-placed spices and the tart appeal of lemon and orange. This beer could have very well been the #1 of this grouping for its distinguished charm. Duvel has survived as the flagship brew nearly 140 years and four generations of the Moortgat family of the Duvel Moortgat Brewery in Breendonk, Belgium. This brilliant micro-brewed blend from Brooklyn, NY gets its origin from the Bavarian royal family. During the 1800's this beer became vastly popular amongst German immigrants in the United States. It is a great ale with a pronounced taste that includes an assortment of spices, cloves, melons, and the signature tinge of banana that wheat beers are prized for. Brewed from an equally halved mixture of German wheat and barely, it is traditionally left unfiltered which adds to the hazy appearance and depth of flavor by keeping a trace of yeast in the beer. Easily holds down the #2 spot as a real pleasure to drink. Chimay caps off the top 5 as a strong ale that boasts 9% ABV. 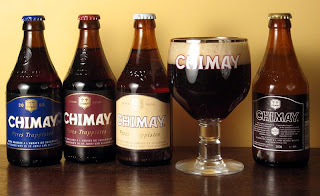 It is brewed by monks in the Trappist monastary located in the Belgian municipality of Chimay. Chimay blue is one of four ales produced in the abbey - Chimay Red or Rouge, Chimay Blue or Bleue, Chimay White or Blanche, and the Chimay Black or Dor'ee which is produced to be drank solely by the monks or people in association with the abbey. The Chimay Blue is considered the Classic brew or the Grande Reserve. It is defined by it's light and pleasant roasted malt taste that has absorbed a hint of fruit and rose. The Chimay Blue has a marvelous blend of bitter and sweet and an incredibly enjoyable taste despite it's high alcohol content. When purchased in the larger version, it comes magnificently bottled - and corked - for a very impressive presentation. The Chimay Blue is a great choice for #1 and it appears in the 99th percentile on most world rankings of beers. This list could have obviously gone a multitude of ways. I realize that it looks a little offbeat with the Yuengling rounding out the bottom, but this was a list done with personal taste in mind and with taste comes emotion. I will continue to explore the complete diversity of alcohol from around the world in pursuit of becoming a well-cultured person and an esteemed member of a more distinguished society. By the way Chuck, all your beers are gay European beers. Grow some balls.